This Saturday, September 24th, Christie’s New York will offer wine collectors a unique opportunity to bid for some of these “crown jewels.” The auction house will present a selection of rare bottles from the private cellar of Inglenook owner Francis Ford Coppola, including two bottles of the legendary 1941 vintage. All wines in this special offering were acquired by Mr. Coppola when he purchased Inglenook in the 1970s and have remained undisturbed all these years. Inglenook Vineyards was founded in 1879 by Gustave Niebaum, a Finnish sea captain who used his enormous wealth to import the best European grapevines to Napa. 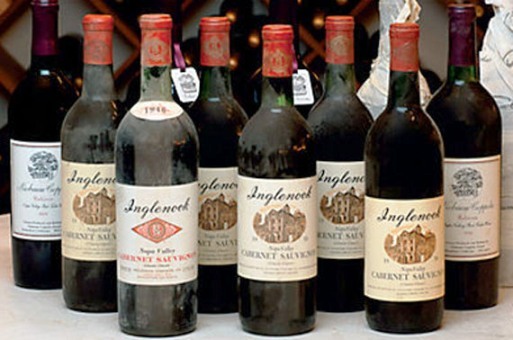 Over the next several decades, under the guidance of the legendary John Daniel, Inglenook built a reputation as the source of some of the finest wines ever made. By 1975, however, when Francis and Eleanor Coppola first purchased part of the famed property, the Inglenook Estate had long since been broken up and its name sold off. The Coppolas spent the next twenty years reuniting the vineyards and restoring winemaking to the historic Inglenook Chateau. Today, in addition to the Cabernet Sauvignon that dominates the Estate, the Inglenook acreage is also planted with Zinfandel, Cabernet Franc, Merlot, Syrah, and six acres of white Rhone varietals that produce the estate's flagship white, Blancaneaux. Inglenook is now completely restored to original dimensions and is once again America's great wine estate. The Christie’s auction now offers fine wine collectors the opportunity to purchase bottles so rare that only a handful remain in the original cellars at Inglenook. To mark the occasion for posterity, successful bidders will receive a handwritten note from Francis Ford Coppola with each bottle purchased, in custom-made wooden box designed specifically for this sale. One bottle of the rare 1935 vintage from the “Golden Era” of John Daniel Jr. wines (estimate: $600-800). A two-bottle lot of the celebrated 1941 Inglenook Cabernet Sauvignon (estimate:$8,000-12,000). Christie’s wine specialists note that the 1941 vintage can rightly take its place among legends like the 1945 Mouton-Rothschild, 1982 Lafite Rothschild, 1900 Margaux, 1961 Latour and 1989 Haut Brion, some of the most celebrated, most valuable and longest lived Cabernet Sauvignon-based wines in the world today. A vertical of 12 key vintages from the years 1946 – 2008 presented in a bespoke wooden case signed by Mr. Coppola (estimate: $3,000-4,200). Proceeds from this lot will be donated to Shigeru Ban Architects + Voluntary Architects Network, a charity that helps build temporary housing for tsunami victims in Japan. To view the complete e-catalogue for this sale, please visit this site.